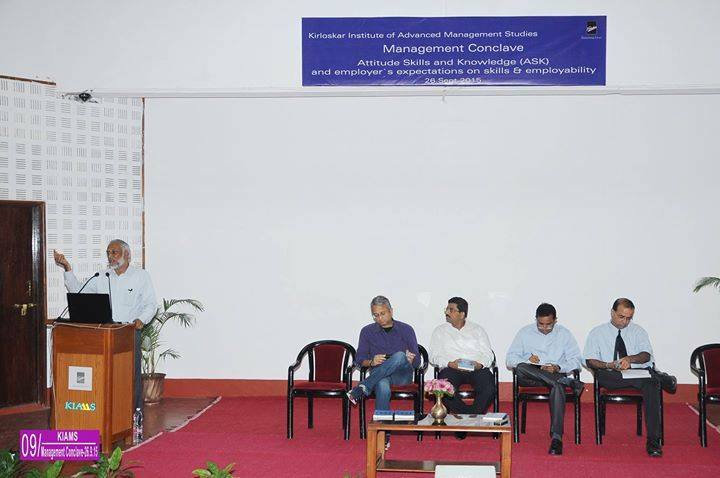 Kirloskar Institute of Advanced Management Studies recently organized a conclave “Attitude Skills and Knowledge (ASK) and employer’s expectations on skills & employability” at its Harihar campus. The event held on the 26th of September brought together several big names from industry and academia to discuss the attributes that can make successful management professionals of tomorrow. Given the high relevance of the conclave, it was only natural that we talked to some of the students to evaluate its overall success. This conclave is the first in the series of events KIAMS will be organizing this year, in its Silver Jubilee year. Students like Arpit remain appreciative of the fact that the B School holds seminars and conclaves regularly to offer them hands-on experience. Others like Vinay Kant Maurya, B 17 look at it as a responsibility to learn and deliver. “I won’t let these opportunities go in vain. I will do my best to make the most out of them and interact with professionals from different industries and learn from their experiences,” he says. When asked if he had any suggestions on the subjects for future conclaves and seminars Vinay Says, “It would be great to hear from professionals in specific areas like finance, operations, and International Business. It would help us with specific exposure for our future careers.” Arpit, on the other hand, wants future seminars to delve into digital marketing, e-commerce, and rural marketing. He believes these areas are evolving and knowledge on the subjects would give them an edge. But for now, they seem thrilled by the takeaways from the recently held conclave.